Did you lose your car key? Do you need a car key replacement? All Locks and Doors can make and program car keys from scratch for your vehicle. We can also duplicate your car key and make you a spare car key. When you need a car key replacement, typically you need it ASAP. We provide car key replacement services to the entire Livermore Valley and beyond. Whether you lost your car key at the farmer’s market near downtown Livermore or misplaced your car key somewhere in the midst of the Stoneridge Mall in Pleasanton, All Locks and Doors is here to help. We will come to you (at home, at the Livermore Outlets, at work in Dublin, at the Bart Station in Pleasanton…) and provide you with a car key replacement on the spot. We will try our best to get you back in your vehicle, with your new car key replacement within the shortest amount of time possible. We all know what it feels like to lose our keys. It’s not fun. It’s especially not fun to lose our car keys. Many cars nowadays have high security car keys and they aren’t cheap. This unexpected cost can be difficult to handle. We understand this and will do our best to help make the situation better by providing quick, excellent service at reasonable prices. If you need a car key replacement in Livermore, CA, Pleasanton, CA, Dublin, CA or the surrounding area – give us a call today. We can give you a quote for your car key replacement over the phone. We can provide you with a car key replacement for many (if not most) of the car out there (numerous makes, models and years). If you need a Honda Accord car key, a Toyota Prius car key replacement or a Ford F-150 car key replacement, we can help you. When working with car keys things can sometimes get a little tricky. Keep in mind that we must not only cut the keys to work mechanically with your vehicle, we must also (in most cases; e.g. transponder car keys) program the car key to work with your vehicle. 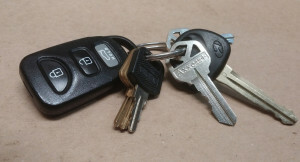 This is because nearly every car key (transponder or high security car key) works as a mechanical key yet also contains an electronic chip that communicates with your car’s computer system. We have the right equipment and tools to provide you with your car key replacement immediately and ensure that it works smoothly with your car’s ignition switch. We can even help you with your car fob replacement and/or with your car remote. We are experts in everything that contains a lock and a door, and cars are no exception. So if you need a car key replacement, give us a call today. We are here to help. We al All Locks and Doors are your knowledgeable, reliable and trustworthy automotive locksmith (aka car locksmith). Need a car key? Call now.